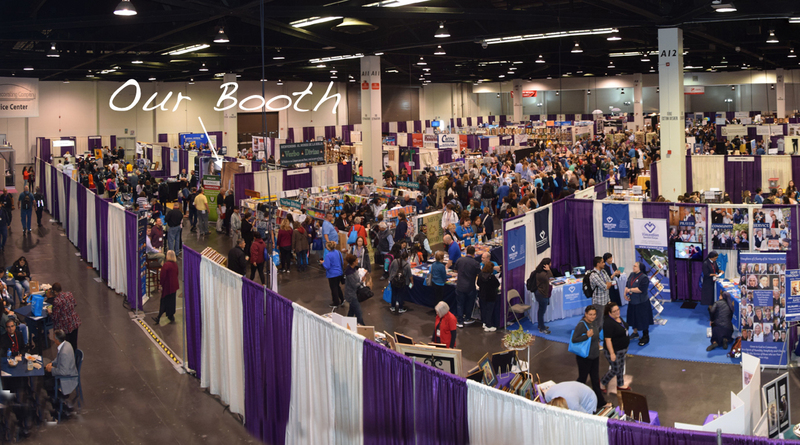 Thirsting for Justice was the theme of this year’s Religious Education Congress, an annual event held in the Anaheim Convention Center and sponsored by the Archdiocese of Los Angeles. The Congress offered more than 300 workshops presented by 200 speakers and welcomed over 40,000 attendees during a three-day period. Various liturgies both Eucharistic and from the Divine Office were celebrated throughout the days from many different traditions and styles of prayer. This is the single largest gathering of this kind specifically in the United States and offered a great venue for connecting to young people, their teachers and catechists and other Church groups and organizations. 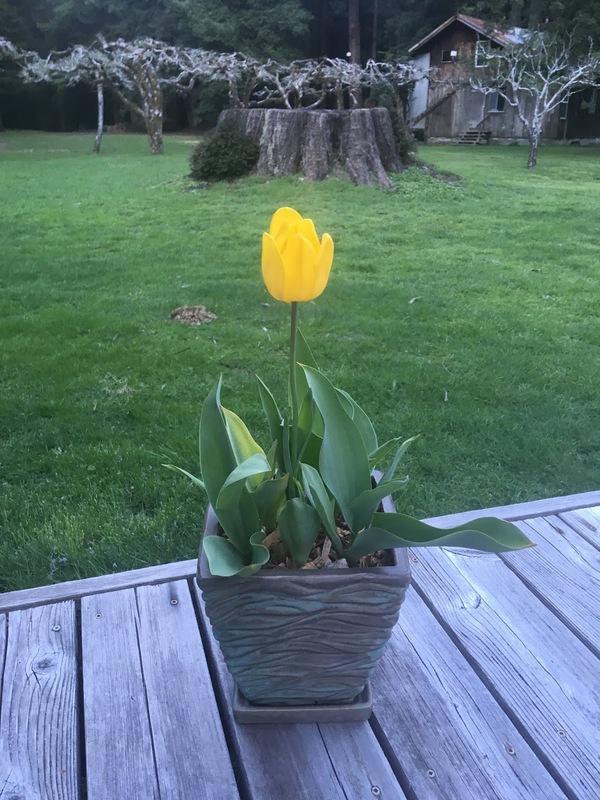 In order to promote vocations and increase awareness of Cistercian/Trappist monastic life, Redwoods Abbey with the Abbey of New Clairvaux in Vina CA decided to participate in this year’s Congress. 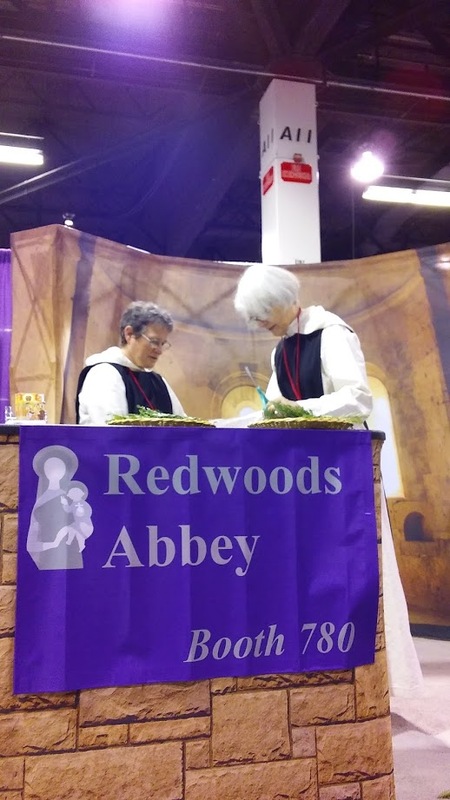 Sisters Ann Marie and Suzanne from Redwoods and Fr Guerric from Vina staffed our little booth in this huge exhibition area that included publishers, vendors of religious goods, religious orders and congregations and many wonderful Catholic service organizations. In this milieu, it was exciting to be able to present another face of Catholicism: contemplative monastic life. 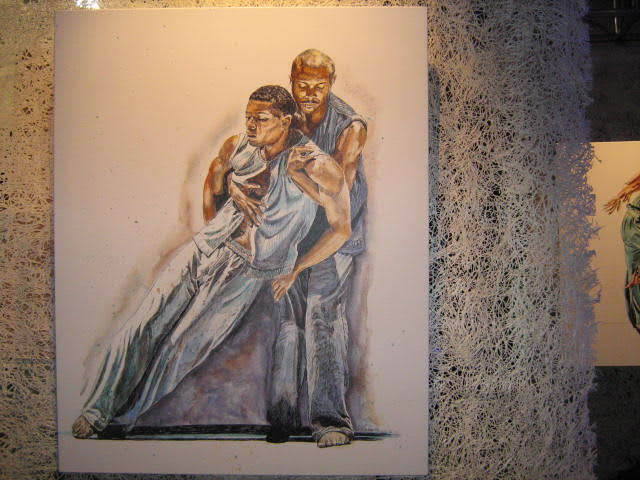 The background of our booth was a 10’ x 8’ photo of a 12 century Cistercian Sanctuary at Le Thoronet Abbey in France. There were no other words or images to distract in the background. We were hoping that the simplicity, silence and contemplative space in the graphic would convey a deeper experience of our monastic charism to exhibit visitors. 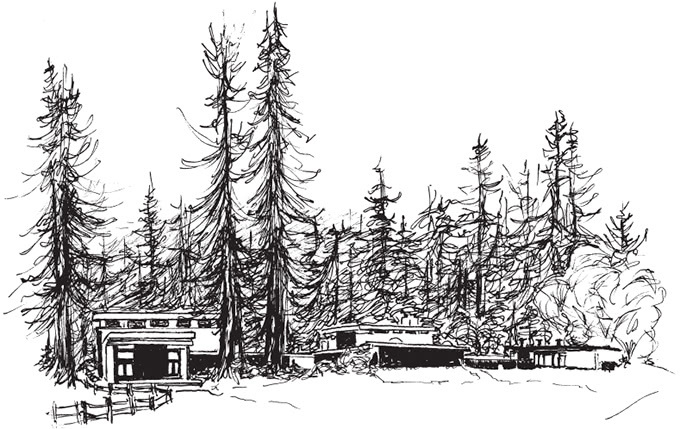 As tokens of our monastery, we distributed sprigs of redwoods and stickers to people passing by. We also handed our Regional Brochures that listed all the monasteries in the US Regions and flyers to advertise Redwoods Monastic Experience Weekend. Our Cistercian/Trappist presence was especially appreciated by those in Youth and Young adult ministry and catechetical publishers who were eager to teach their students about the various forms of religious life in the Church. Their response to us and our monastic way of life was very encouraging and a sign of hope for all contemplative orders in the Church. 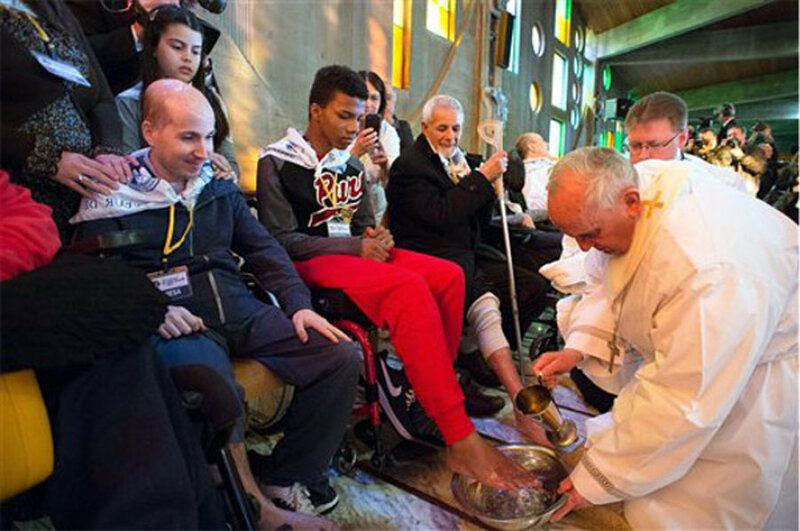 One very unique feature of the Congress is its celebration of the multiculturalism within the Catholic Church. A special area was reserved for displays from different countries and cultures. 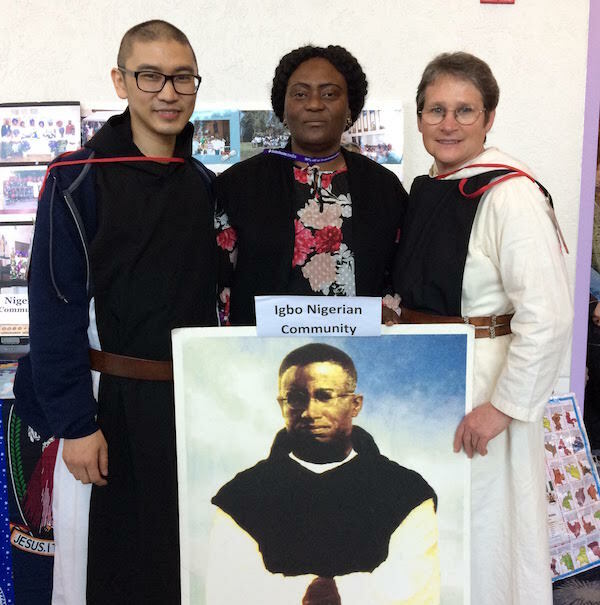 When Sr Ann Marie and Fr Guerric visited the Igbo-Nigerian booth, they were surprised to be greeted by large posters of the Cistercian Trappist St. Cyprian Tansi. This was a reminder that Trappist communities span the globe, and that the monastics of our modern world still hold an important place in the heart of the people of God. (See photo below). In another building across the plaza of the Convention Center, a massive Sacred Space hall was set aside for exposition of the Blessed Sacrament, a meditative art exhibition on the theme of justice, and a labyrinth. This space was the inner heart of the Congress: a silent contemplative resting ground in the center of a very active Church Congress. The Sacred Space mirrored the role of the monastery in the church– hidden, interior, and prayerful yet pivotal to the vibrancy and fecundity of the activities going on beyond its walls.